Excerpted from Art of the State: Texas, by Michael Ennis, published by Harry N. Abrams, Inc., New York. Texarkana in East Texas is almost 200 miles closer to Atlanta than it is to El Paso; Stratford in the Panhandle is as distant from Brownsville on the Mexican border as Manhattan is from Daytona Beach. Yet a single line of demarcation can partition this vast territory. The 98th meridian — which roughly coincides with a 300-mile rock terrace known as the Balcones Escarpment (to the Spanish its limestone tiers, up to 1,000 feet high, resembled a balcony) – is the natural divide between the woodlands and rich blackland prairie of the coastal plains and the arid, treeless high plains of the West. 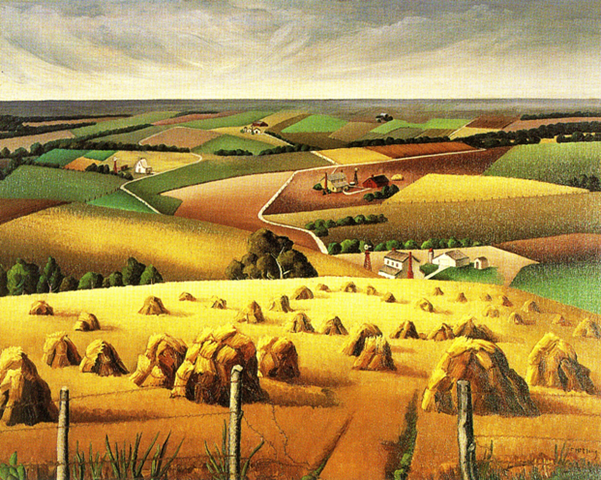 For centuries pioneers stared up at the escarpment and knew they couldn’t survive in the dry country beyond. But in the mid-19th century, cattlemen began their conquest of West Texas — an achievement, claimed historian Walter Prescott Webb, that forged a new civilization entirely distinct from that of the eastern U.S. Webb’s 98th meridian accurately drew the fundamental cleavage in Texas history and society: between the cotton-raising, antebellum culture of the coastal lowlands, and the cattle-raising, Wild West culture of the high plains. In short, Texas can he divided into two parts: south and west. grazed cattle on brick-red prairies around Nacogdoches. By the 1830s southerners were chalking “G.T.T.” (Gone to Texas) on their cabins and streaming into the area, bringing their slaves, hogs, and cotton culture. 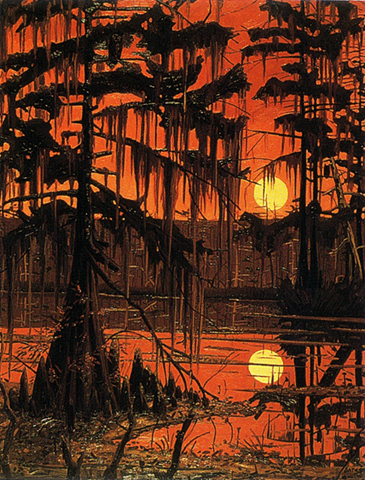 Caddo lake, ringed by huge cypresses and deepened by an immense natural logjam on the Red River, allowed steam boat navigation all the way from New Orleans, making the town of Jefferson Texas’s second largest port until Army engineers dynamited the logjam in 1875. The Piney Woods logging boom began in the 1880s, quickly depleting the virgin growth; 20th-century reforestation has actually extended the timberland into old pastures and plantations. The only primordial wilderness left in the region is the Big Thicket National Preserve, an almost impenetrable, astonishingly complex ecological mosaic and a monument to biodiversity. The shotgun-toting old-timers who still hunt feral hogs in the Big Thicket river bottoms preserve southern traditions and dialect little changed since before the Civil War. 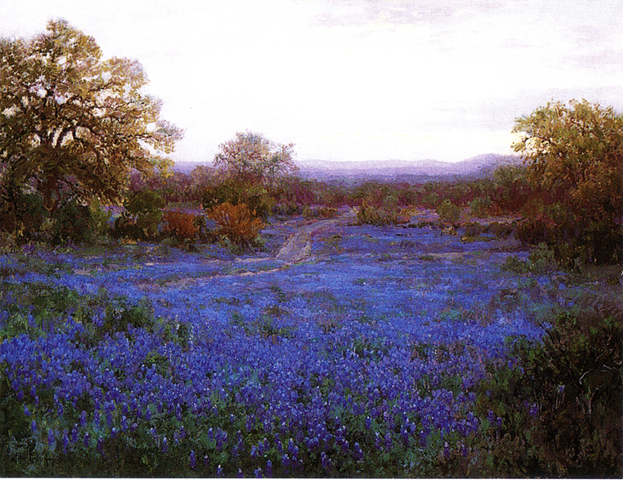 Bluebonnets and Huisache at Twilight, by Julian Onderdonk, 1920-1921. The Roger Houston Ogden Collection, New Orleans. The wide-angle perspectives that dominate the Texas landscape narrow to a more intimate scale in the central Texas hill country. Here, crystal clear artesian springs and frothing, cypress-lined rivers have etched the limestone shelf above the Balcones Escarpment into a tracery of knobby, juniper-and-oak-sprinkled hills and small valleys. In the mid-19th century, immigrants arduously cleared rocks, built fences and mills, and founded small towns whose ethnic festivals and lime stone buildings bespeak their European roots. The countryside offers picturesque anomalies like the fern-draped grottos of Hamilton Fool, created when the roof of a subterranean river collapsed. or Enchanted Rock, a granite dome known to creak at night and glitter eerily beneath a full moon. The West is still wild beyond the Pecos River, where counties the size of New England states boast four figure populations. Big Bend National Park is the chief attraction of the Trans-Pecos; shunned by Spanish explorers as despoblado (no-man’s land), the spectacular landscape was created as the Rio Grande River carved through volcanic mountains, leaving behind narrow canyons racing with whitewater rapids. The park’s temperate Chisos Mountain highlands are forested with Mexican piñon, ponderosa pines, cypress, and indigenous Chisos oaks; on the scorching Chihuahuan desert fiats below, roadrunners and horned lizards scurry among ocotillo, lechuguilla, cane cholla, and other spiky succulents. .